The Post-Meridian Radio Players/Hub of the Universe Productions introduced me to the fascinating world of radio theatre this evening. I have been aware of their work for a while now, but had never attended a performance until tonight’s dress rehearsal for their Summer Radio Mystery Theatre. The show runs Friday, July 27 at 7:30pm, and Saturday, July 28, at 2:00 and 7:30pm; based on tonight’s dress rehearsal performance, you’re in for a fantastic time. The cast transforms, through tone, costume, and posture, all mystique and campy nuance of old time radio. The sound effects and artistry round out the landscape and make the story all the more real. Three productions take us from comedy to suspense to mystery. More information is available on PMRP’s site. Buy tickets online, or stop by Responsible Grace Church (formerly Urban Promise Church) at Russell Street and Elm (Davis Square) in Somerville for tickets at the door. 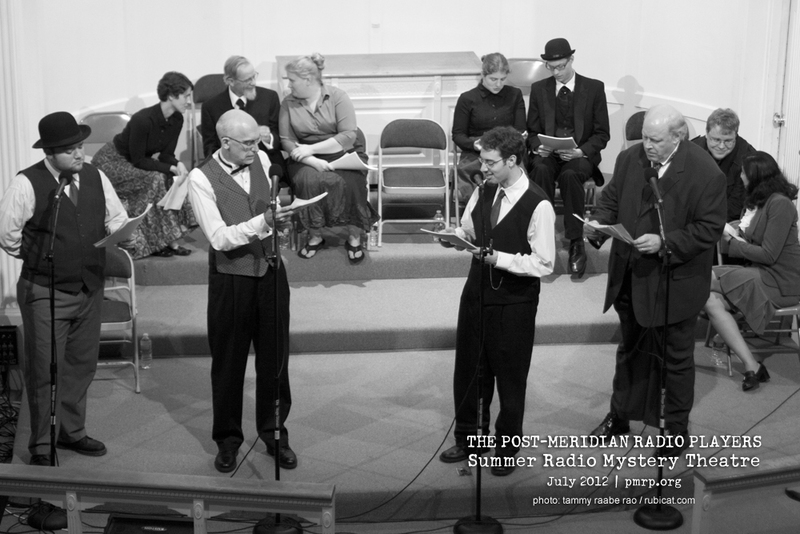 For more photos of the cast and crew from The Summer Radio Mystery Theatre, visit my Facebook photo album. Hub of the Universe Productions is a New England-based organization dedicated to the production of audio drama. HOTU produces projects for both studio recording and live stage performance, as well as offering sound design, voice-acting and custom music services, with an focus on providing services to groups like ourselves.